In case you missed it, I have a goal to collect postcards from all 50 states this year, along with learning facts about Agriculture unique to each area.I have posted most of the postcards I received on my Stamps, States, and AgFacts page. Take a look. There are some great facts on there. If you include a return address, I will return the favor with a postcard from Arkansas.Have you sent your card yet? I have received some interesting comments about this project. First thing is to find a postcard and remember that thing called a post office where you can buy stamps. So far I have received two postcards with recipes, so I decided to try them out. I enjoy cooking meals from scratch, but do not claim to be worthy of the Food Network. From Florida I got a recipe for Old South Pecan Pie, unfortunately no return address on this one, so I do not know who to thank. 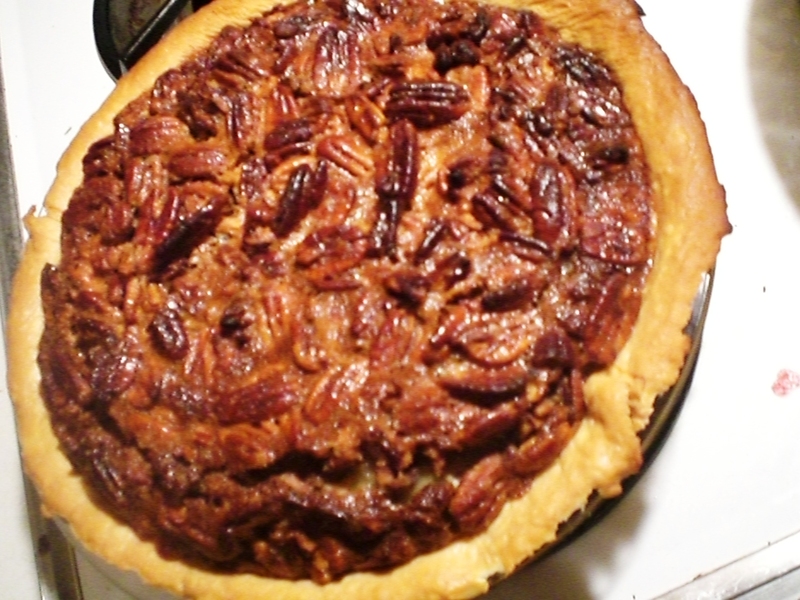 This one turned out really good, and pecan just happens to be one of my favorite pies. It never hurts to have a little comfort food from a Southern kitchen! Do not forget to thank a Vermont farmer for the maple syrup and a New Mexico farmer for the pecans! Beat together sugars and butter. Beat in eggs, beat well. Beat in syrups, salt, and vanilla. Stir in pecans and mix well. Pour into unbaked pie crust. Bake at 350 for 40-45 minutes. Cool and serve. Now for a trip into the uncharted waters with a Cherry Pie from Woodbridge Dairy Farm in Byron Center, Michigan (@wbdairy). Did you know Michigan is the world’s largest producer of tart cherries? When I made this pie, it turned out extra juicy. Then again, I said this was uncharted territory and I am no pro. I was informed by Jenn Zeller (@thesdcowgirl) and my grandmother that this recipe is missing corn starch. You tell me. 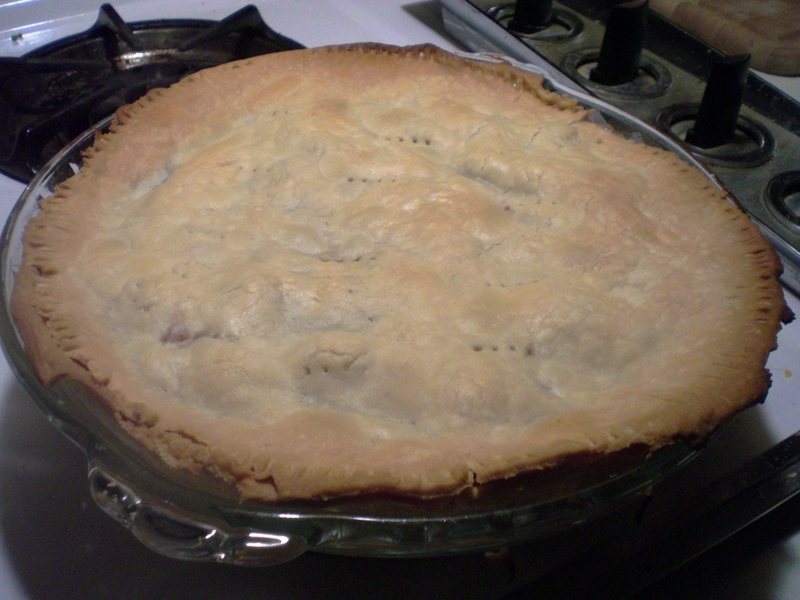 Line pie pan with pastry Put in cherries. Mix juice, salt, sugar, and tapioca and pour over cherries. Dot with butter. Put on top crust. Bake at 400 for 40-50 minutes. Cool and serve. Find any postcards with great recipes from your area? Maybe you can put together a card with your own recipe? I would love to make and post your recipes on here! Get that $0.29 stamp and send them my way. Find out how at the bottom of the States, Stamps, and AgFacts page!